Besides blogging, I spend my time online at Twitter, Flickr and Facebook.Â I am already sharing my Flickr stuff on my blog (that is the 365 photos).Â I have been thinking for a while that it would be nice to post my Facebook and Twitter updates on my blog.Â I don’t update my status too often, but I am usually doing something exciting outside, away from my computer and I want to share.Â I have now linked things up so that when I use Twitter or Facebook to update a status, it posts on my blog. I am going to keep the updates to 2 or less updates per day, but it is a nice way to stay up to date.Â Additionally, I can do it all from my phone very easily. So, any new posts that you see that are only one line are Tweets I wanted to share on the blog. 1.) Pay off our debt. Â We have about 3600 left to pay off. Â This is a small about compared to the 50,000+ debt we started out with in 2006. Â We have already changed our ways so that we never have to deal with being in debt again. Â Until then, celebrate with us when we become debt free in March this year. 2.) Make it to 130 pounds and size 8. Â I am back to the weight I was before I got pregnant with Cyprus, but I still have the weight from Daphne to work of. Â I’ve got another 35 pounds to shed before I’m back to where I belong. Â I also have a pair of “skinny jeans” (all women do) that are size 8 that I would like to wear comfortably around. 3.) Run the Steens Mountain Rim Run 10k in August. Â It is a pretty unique run for me. Â It is near my hometown, which makes it special, but the race STARTS at 7,800 feet and goes uphill to 9,700 feet. Â That is a very challenging run! 4.) Run a half marathon in October. Â This will be the peak of my running. Â Running is a great way for me to stay in shape, unwind at the end of the day and shed those extra 35 pounds. 5.) I would like to also run Hood to Coast if I can get on a team this year. 6.) Take a cruise with the family this year. Â Jared and I have jointly decided when we are out of debt that we want to take a nice family vacation. Â We both thought a cruise would be fun. Â I’d LOVE to go on a Disney cruise with the kids. Â At least I can dream right? 7.) I want to learn to make my own household product. Â I already make soap and lotion. Â I want to add deodorant and toothpaste to my list of home made products. 8.) I would like to complete the 365 photo projects that I started in November. Â I am enjoying the creativity and stability that they bring to my life. Â They aren’t easy, but I am learning and growing each day. 9.) I have been wanting to knit Cyprus a handspun sweater for a long time. Â I am now putting it on my list of goals for the year so that I have no choice but to succeed. Â The yarn is already spun, I just have to attack the pattern. Â I have never made a top for anyone ever so this should be challenging. 10.) Change our house over to rechargable batteries. 11.) Reduce energy use by turning of lights, unplugging electronics and leaving computers off when not in use. 12.) Reduce waste from household and increaseÂ recyclingÂ by composting as much as possible (yes, even the paper waste). 13.) Be nicer to my husband. Â Jared has taken a lot of flak from me after a hard pregnancy and a hard recovery. Â He still gets some intense emotion from me when I am frustrated, and I’m going to find a way to redirect that. 14.) Become involved in the legislature for midwifery this year. Â I have a nomination to hold a position on the licensing board and I will find out soon if the Governor appoints me. One thing that I think I have done to set myself up to accomplishing the goals listed above was that I made a change in my life and general attitude. Â I didn’t wait until January 1st to decide to start these things. Â I started my 365 project on Jan 1 expecting to complete it on Dec 31. Â I started my 365 at Thanksgiving so that I would be well into it as the new year rolled around. Â Many of these things are now a matter of routine and habit at this point and I just have to keep up my hard work and determination to meet my goals. Â I started running in increasing intensity lately and am up to 2 miles 3 times per week already. Â This is much easier than going from couchÂ potatoÂ on Dec 31 to marathon runner on Jan1. Â Goals take work and determination and sometimes have setbacks. So I posted last year about what I wanted to accomplish in 2009. I went back to take a look and see if I accomplished the goals I wanted to. 1.) Graduate with a BS in Social Science this year. Oh yeah! Â Goal number one accomplished!!! 2.) Get out of debt. So close. Â As of right now, we have about 3600 left in debt to pay. Â Jared pointed out that this is about what we paid in medical expenses on the birth. Â We knew this goal was a long shot, so I’m not surprised. Â We did Â work diligently toward this goal last year though. 3.) Get organized. There are places in my house that always have stacks of things that â€œneed to be doneâ€. My desk is the main culprit. I spent some time last weekend cleaning, and managed to have only a pen on the desk when I was done. We are going to invest in some organizational tools so that everything in the house has a place and is in that place. We even made room in the budget this month to cover those expenses. This wasn’t hard to accomplish once I got into my 6th month of pregnancy. Â There are still places that things stack, but it is MUCH better. 4.) Get rid of things in our house that are unnecessary. See above re: 6th month of pregnancy. 5.) Take more photos and videos of Daphne. This actually worked out really well. Â I took tons of videos and photos of Daphne and even got a system worked out for getting them on the blog. Â Things are going well in this department. Â In case you wanted to know statistics, I took 3 hours of video in 2009 and 4,224 photos. 6.) Have a successful VBAC . Yay. Â This happened and was even better and more wonderful than expected. 7.) Discover the direction of my photography. This happened very late in the year, but it did happen! Â I am back on track. Â I’m doing a 365 for creativity and inspiration. Â I am now taking 8 weddings next year as well as 8 births. Â I’m open for maternity, family, newborn and child photography, so tell all your friends. 8.) Get healty. I am feeling ill with this pregnancy, and it is causing me problems. I have never been so fat (literally). I may top 200 pounds with this pregnancy. The last time I got on the scale when I was pregnant, I weighed 200 pounds YIKES! Â The good news is that I have been working diligently to shed it, and I’m down 35 pounds so far, which is exactly half way to my goal! Rebecca and I put together a perennial herb garden that is useful, beautiful and easy to tend! 10.) Expand my animals and get better at it. I figured out the direction I was going with my rabbits. Â I did not lose one rabbit this year that I didn’t expect to lose. Â Everyone is doing well, and I’m getting pretty good at this homestead in the city thing. It’s not hard to tell a woman who is obsessed with sewing to finish something. Â Cyprus now has all the diapers he could want in the world! All in all, I did a pretty good job accomplishing the things I wanted to accomplish in 2009! As 2009 draws to a close, I am spending time on my computer getting caught up. Â I have now organized all photos into their proper storage location so that they can be backed up. Â Everything has been blogged and archived. Â I have gone through and even gotten the stray photos that were in random locations that I was forgetting about. Â Now that you are fully up to date on 2009, I am excited to see what I get to share with you in 2010. I’ve been working really hard lately trying to get Christmas gifts out to people. Â Somewhere along the line I agreed to make nothing but handmade gifts for people this year for Christmas. Â I underestimated the starting time on ALL of the projects. Â Factor in a baby who only wants to spend time in his mom’s arms, and I’m a little behind. Â When there is so little daylight to be had this time of year, I always feel like I need to be going to bed at 8, so I don’t get to stay up too late to work either. The good news is that the important gifts will be done tomorrow. Â The big lot of Christmas cards went out yesterday, so I should be able to relax for a little bit before I realize that I have a lot more things to do before Christmas. Â I was talking to Jared about it. Â It isn’t that I don’t enjoy doing each of these things, I’m just ready for a bit more laid back time. The good news is that I have kept up with my 365. Â I just haven’t posted any of them yet for you. Â I expect to get caught up on those tomorrow. In case you didn’t notice, I am catching up on some old, OLD photos. Â I like to post many of the photos that I take. Â That can be a little time consuming, so I’ve gotten backlogged recently. That is what all these little posts are about. Â I am trying to catch up so I can stay current with photos–famous last words, I know. When Flaff moved on there was an obvious hole in our household. Â There was no one to eat the food dropped on the floor, no one to walk with to the mailbox and no snoring going on at night. Â After a lot of thought and a lot of begging on Daphne’s part, we decided to become adopted by another pug. 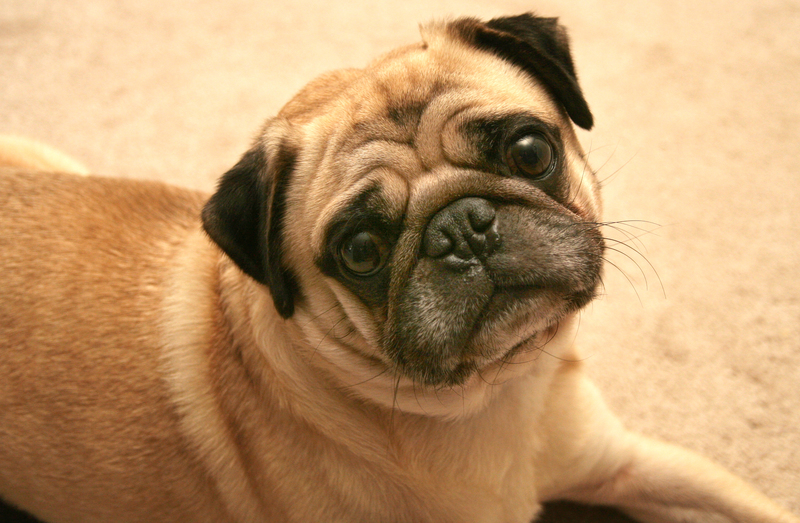 Pugs have such silly personalities that make them perfectly suited to being companion animals. Â We decided to try getting a puppy so that the puppy would be able to grow up with the kids. I picked her up in Portland before one of my doctor’s appointments and instantly fell in love. Â I haven’t had a puppy in my life for a long time, so having someone to play with again was a ton of fun. Â Of course, Jared fell in love again also. This is a photo of Jared and Daphne checking her out for the first time. Getting a puppy was the perfect idea. Â The newness was just the right thing for Daphne. Â She had been spending a lot of time torturing her brother and trying to play with him, but a puppy was new and was able to play with her for hours on end. Â It worked perfectly to giver her a companion and someone to play with. Daphne helped name her Targy, and she took on the name the moment we got her. Â I must admit that Daphne calls her “Bolt” after the recent Disney movie, but she usually returns to her old Targy self by the end of the day. Of course, Targy took to Daphne as well. Â She loves to play with her and sleep with her. Â At bedtime, Targy runs into Daphne’s room every time she can in an attempt to sleep on the bed with her. Â They sure do look cute together. We have finally managed to get her potty trained, and after another week or two of work, Targy can sleep in Daphne’s room with her. Â After all, aren’t they cute together? Be sure to look for more photos including Targy as a family member from here on out. Hello! Â Happy Thanksgiving to you and yours. Â I hope that your day has been lovely and full of joy. Thanksgiving has always been one of my favorite times of the year because I liked getting to help cook and eat recipes that have been in our family for generations. Â After Daphne was born, Thanksgiving took on a lot more meaning for us. Â We are trying to start our own family traditions for this time of the year. Â During November andÂ DecemberÂ it is so dark and lonely outside we can’t help but invent things to do as a family that keeps us all happy until the spring brings us more sun. We have made the trip over to Eastern Oregon every year to spendÂ ThanksgivingÂ with my family. Â It is always chaotic, loud and crazy. Â The good news is that a person can’t get lonely or go hungry. Â My grandma has hostedÂ ThanksgivingÂ for as long as I can remember and anyone and everyone is invited to come. Â This year, 30 people came and ate and enjoyed the holiday with us. Â We cooked for days to get enough food together. Â When the time came, everyone enjoyed themselves and everyone got plenty to eat. The ability to speak and act as I please in a free country. We recently lost a member of our family who has had a profound effect on us. Â This post is a little late in coming, but that makes it no less important. Â After 4 really great years together, we had to put Flaff down. Â His body was starting to shut down, and many of his systems were failing. Â After a long thought process, we decided that it was more kind to send him on his way rather that be selfish and keep him with us. Flaff went through many important events in our evolution as a family. Â Back in September of 2005, Â I was working out of the house 10+ hours each day with plans to head to Greece for another 6 months. Â We decided to look for a dog to keep Jared company and help get him out of the house occasionally. 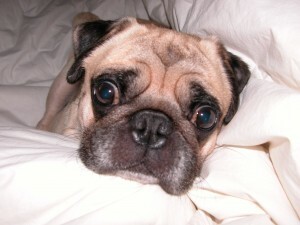 Â Our search took us to a rescue organization who had just one dog available–a pug. Â Jared had a pug as a kid, and wasÂ enamoredÂ with the kind nature and puglyness ( a pug character of being so ugly they are cute) of the breed. Â The situation was perfect, and we decided to do everything in our power to get him. He was aÂ rescueÂ dog, which means that we were literally taking him from a bad situation and rehabilitating him. Â He was being used as a breeder in a puppy mill, and he was severely abused. Â Even to his final days he shied away when approached from above. Â He was so out of shape when we got him from being left in a cage all day he laid down on our first 4 block walk and had to be carried the rest of the way home. He suffered fromÂ seizuresÂ when we first got him. Â It is interesting to note that the more love he got, the lessÂ seizuresÂ he had. Â they diminished almost completely at the end. After much love, patience and companionship, he started to become more trusting and loving. Â He always was more Jared’s dog. Â He would lay down next to him every afternoon for a nap. Â When I was pregnant, I used to bring theÂ comforterÂ in from the bed and force him to lay down with me and be my baby. One particular quality of him was that he would always find the smallest piece of fabric on the floor to sleep on. Â If it was a piece of paper, or a washcloth, a towel or a pillow, it was superior to sleeping on the bare floor. Â If we didn’t want it slept on, it could not be on the floor. It really was rewarding to see how far upscale a dog could become with some love. He was the best kids dog you could ever ask for. Â He played nicely with Daphne. Â She used to crawl up to him and generally maul him in any manner she could, and he took it as love, rather than abuse. Â She even went through a spell where she used to sit on him and call him her pony. Â He then became her baby by being tucked in under covers at any opportunity. Spending 4 years with him was a lovely adventure, and he will always have a place in our hearts. Â We will miss you Flaff. Â Thank you for being such an important part of our family. I know that I have not been blogging a lot lately, and it kind of hurts readership.Â It has been so busy around here, that when I get to stop at the end of the day I end up falling asleep.Â I’m not answering emails or even reading my own blogroll lately.Â I try to only spend time on the computer when the kids are asleep so that I can spend the rest of the time doing things I can blog about.Â That makes for a nice Catch-22, because then I’m too tired to blog at the end of the day.Â I have a LOT of photos and fun things to share that I will be updating in the next few days, I promise. I thought that a good way to continue to be motivated to get on the computer to type at the end of the day would be to remind myself why I even have been blogging.Â I have many purposes for doing what I do up here, and I thought I’d share them with you and remind myself why I bother to do this at all. #1 Keeps my writing skills sharp – I gave a lot of blood sweat and tears to be able to write with clarity.Â Though I don’t always proofread what I post (I know, a cardinal sin), I at least know that I can take my thoughts and put them on paper with some clarity.Â One of my college writing professors said the best way to stay sharp as a writer is to keep a journal. #2 Keep a written record of my life- I started my blog in November of 2004.Â This means that I have a running written record of my life online available to look at and refer back to.Â I wrote almost daily while I was in Europe for 3 semesters.Â The writing from that time has proven incredibly valuable to me because I can read what I wrote in the moment and be transported back to that time in my life that has been so influential and transformative.Â It has happened on more than one occasion that I have been doing reserach for one project or another and a google search and brought me back to my own blog! #3 Educate others-Â I spend an incredible amount of time in my life trying to figure out how to be self sufficient and do things myself.Â This includes everything from making cheese to gardening and making soap to sewing diapers.Â I like to have a place to write about my experience and give other people ideas for their own lives.Â I will start doing PDF tutorials one day of many of the things I do, but my two kids are keeping me on my toes at the moment.Â All of my ideas are stolen, but my execution of them is unique to my own viewpoint. #4 Grandparents/Family/Friends – Our family and friends are spread out all over the world.Â Many people have never met the kids, but the Internet has allowed them all to “meet” our kids and participate in our family from their own environments. #5 My future self- I am attached to the lovlieness that is involved in raising young children while trying to make it as a housewife and a photographer.Â Time goes by so quickly, and the more I document in photos and in writingÂ what I am doing during this special time in my life (having small kids), the more I will thank myself later.Â Even now, I look at some of the posts from a year or two ago that I wrote about Daphne and I have NO recollection of some of the things happening.Â My life truly changes by the second, and if I don’t document it, it will disappear.Â I don’t tend to give advice to people who are pregnant/have a newborn.Â I do make it a point to tell anyone in that position that the best thing I have done for myself and my kids is to keep a blog.Â People say time flies quickly with children, and they really aren’t lying.Â Document it and savor it. #6 My Mother – My mom died suddenly and unexpectedly at age 31.Â She had a 3 year old a 6 year old and a 13 year old.Â I was 3, and I have very little memory of my life with my mom.Â When I was a teenager, we found a chest that had belonged to her.Â Inside it were 3 hand-written journals, one for each kid.Â She took the time to jot down new teeth, unique adventures and funny things we had said.Â I have a record of my life from when I was a baby that I get to read and enjoy.Â This is a priceless connection to my mom that I am so blessed to have.Â I plan to be an annoying, alive mother/mother-in-law when my kids have kids, but if I should not be there for any reason, this writing is for my own children. #7 Shameless Self-Promotion-Â I love to share photos from unique and wonderful photo shoots that I have done with my business.Â Posting photos I am proud of is my way to share my art with you my friends, not just the clients themselves.